Breeders! 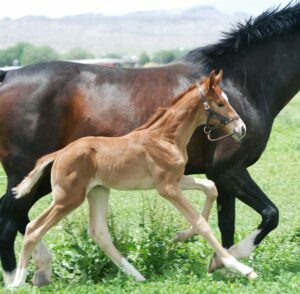 Are you thinking about having your mare tested for the genetic defect WFFS (Warmblood Fragile Foal Syndrome)? SWANA in conjunction with the Veterinary Genetics Laboratory (VGL) at UC Davis is offering WFFS testing for $35/horse. In order to receive this offer, the owner needs to be a member of SWANA, you must be the owner of record with SWANA for the horse being tested, the horse being tested must have SWANA registration papers or be registered with SWANA as a mare/stallion from other recognized association. Both horses with DNA already on file with UC Davis as well as horses needing to be tested for the first time are eligible to get the discounted rate i.e. test can be performed on hair samples, both new and those previously tested, as well as on blood samples stored at the laboratory. Contact the SWANA Office for more information and to arrange testing preferably via e-mail at office@swanaoffice.org or by phone (575)-835-1318.